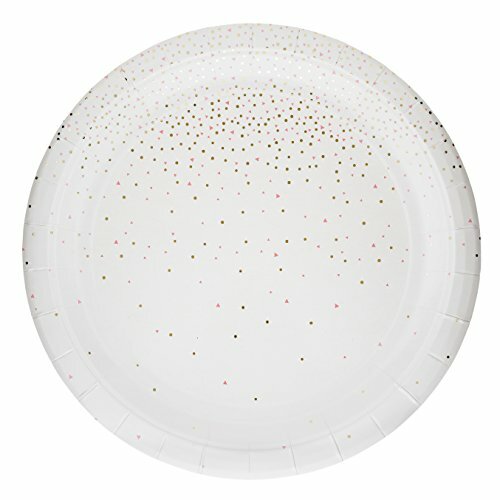 These adorable confetti speckled paper plates are the perfect way to set the table for your special celebration. These beautiful disposable luncheon size plates will keep entertaining both chic and effortless. An excellent color palette for a baby shower, bridal shower, or birthday party! You will receive 2 packs of 10 plates, a total of 20 paper plates. Part of the English Garden Collection, a designer tabletop series by Twigs & Twirls. Plates are printed with food-safe inks and are not intended for microwave use. 20 ct. paper party plates, luncheon size (9 in. round), Pink and Gold. On trend design: features metallic gold and light pink confetti detail and coordinates with Twigs & Twirls Boutique Party Collection. Designer disposable paper plates make clean-up quick and easy without compromising style. Perfect for a birthday party, bridal shower, baby shower, wedding or any special celebration. WHAT YOU GET: 2 packages of 10 paper plates (20 plates total) printed with metallic gold round confetti and geometric light pink confetti. Food-Safe ink, premium quality, beautiful design. Paper plates to make beautiful and clean-up simple. If you have any questions about this product by Twigs & Twirls, contact us by completing and submitting the form below. If you are looking for a specif part number, please include it with your message. Amscan Party Ready Reusable Round Dinner Plates Tableware, 20 Pieces, Made from Plastic, Lavender, 10 1/4"
Hawaiian Tiki Small Party Plates, 48 Count. for Tropical and Beach Themed Parties.